100 years ago next month, the women of Glasgow made history. On 17 November, their rent strike, supported by workers on the Clyde who had stopped work to join them, marched in their tens of thousands all the way to the Old Sheriff Court on Brunswick Street in merchant city. Their, landlords were attempting to get 17 of the 25,000 families who had joined the strike evicted for rent arrears. 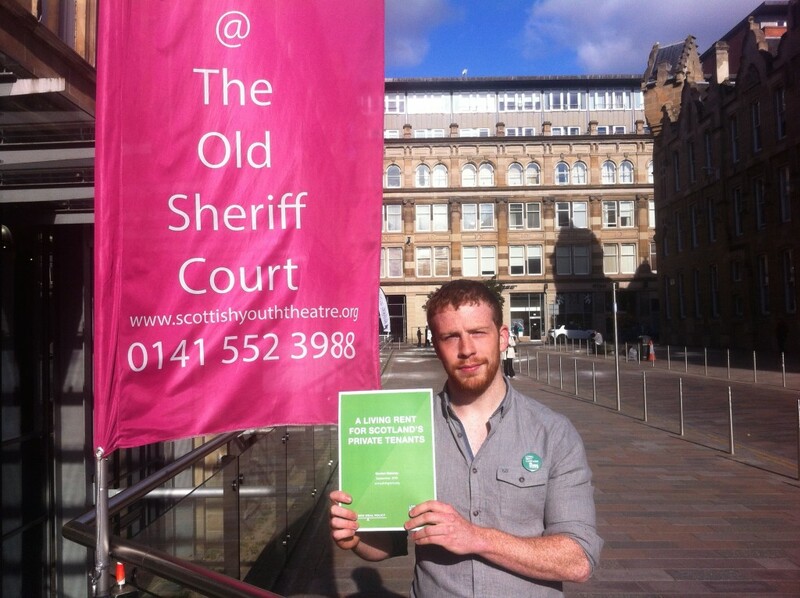 After threats of industrial action and much more, the Sheriff told the landlords to drop their case. The rent strikers won that battle, and their success pressured the UK Government to introduce the first ever Rent Restrictions Act that year. Fast forward a century, and the Rent Restrictions Act is gone. Margaret Thatcher made sure of that. Landlords can once again raise rents with no restriction; and have done so, rewarding themselves handsomely in the process. The private rented sector doubled in Scotland in two decades, rising from 7 per cent to 15 per cent in 2013. From 2011/12 some £1.7bn of housing benefit left the DWP and passed straight into the hands of Scottish landlords. Since the crisis, as wages have stagnated, rent prices have risen steadily, up at least 20 per cent in Glasgow, Edinburgh and Aberdeen. Private tenants spend almost 40 per cent of their income on rent (with one in ten tenants in Scotland in arrears). One-third of all private renters are in fuel poverty – double the figure of those with a mortgage. Big financial rewards haven’t led to improvements in the quality of housing on offer – one in three private rent tenants in Scotland are living in structurally inadequate housing, and more than 50 per cent have failed the Scottish Quality Housing Standard. It’s a situation that needs drastic action, and thankfully we can do something about it – the power lies at Holyrood to introduce rent controls. The Private Housing Bill, published last Thursday, made the first moves towards rent restrictions since the Scottish Parliament was founded. That itself is an important step – an acceptance that the market left to its own devices can’t provide affordable housing for renters – but it was only a small step. The Bill means rents can only be introduced once a year and with three months notice for the tenant, and it gives councils the power to request to the Scottish Government that rent controls are introduced in “rent pressure areas”. It also ends ‘no fault ground’ repossessions, where landlords could get rid of tenants at the end of a contract without giving any reason whatsoever. This is a start and tackles some of the most glaring inequities, but given the severity of the problem, and in comparison to rent control systems in many European countries, it is pretty limited. What we need is a comprehensive system in place to ensure fairness, affordability and rights for private tenants. 1) That initial rents be set against a points system to reflect the value of the property, similar to the system in the Netherlands. 2) That rent increases be capped at a rent affordability index to ensure increases do not push tenants into hardship. 3) A move towards indefinite tenancies as default, away from short-term contracts. 4) Ensuring that all tenants are entitled to a hardship defence in relation to evictions. 5) The creation of a Scottish Living Rent Commission, to oversee these recommendations and to serve as a centre of expertise for the Scottish Private Rental Sector. The report also addresses a number of the myths peddled by those determined to stop any move towards rent controls, namely that such a system would drive landlords out of the market and lead to a crisis of under-supply. There is already a shortage of housing supply in Scotland because the private sector is not building enough homes, but that aside, Maloney shows that the introduction of rent controls has never led to a collapse in the private rental market, and there is no correlation whatsoever between increased or decreased regulation and the size of the rental market. It’s worth taking the time to read the report in full – it outlines a plan for a Living Rent that is fit for a country that really believes in social justice, and is a plan that is a fitting marker of the 100 year anniversary of one of Glasgow’s greatest moments – the victorious rent strike. Download the full report from Commonweal here. Sad to see we have taken a step back,rather than ten forward,let’s put this right ! So what we are saying is that profit and self interest are an evil. That to invest and work hard is wrong. That to use property that one has toiled for as one chooses should be prevented. The answer is to allow more houses to be built by loosening planning legislation and to strengthen social housing provision. By doing that you regulate the market from both a public and a private perspective. Tethering people’s use of private assets is a blunt instrument and bound to fail. TENANT: My rent should be capped! TENANT: And the person you bought this property from – how did it come into their hands? LANDLORD: I presume they also worked hard and saved to buy the property. TENANT: And what about the original owner, the very first person to establish property rights over this dwelling? LANDLORD: Well, if you want to go right back, centuries ago, the original owner must have come into possession of the dwelling through war and violence. They must have fought hard for their property rights. TENANT (rolls up sleeves): Alright, I’ll fight you for it now then! Mark, it’s easy to be a communist if you don’t have anything. I know I am not going to win the popular vote on Bella for saying this but landlords have rights too and just as their are bad landlords, there can also be bad tenants. Not all landlords are greedy capitalist pigs, and many only rent out one property, usually a property which has been in the family. I’m not sure it is easy to be a communist if you don’t have anything, Frank. That was one of the points that Oscar Wilde made in his ‘The Soul of Man Under Socialism’ – people who have nothing have been brutalised to the point where they need outside agitators to step in and cause trouble. Well if Oscar said it, that settles it then. Seriously though, you can’t really be a communist if you own property, or have investments, or you would be open to a charge of hypocrisy? The point about people who have nothing needing outside agitators, (I’m familiar with the quote) results in vanguardism. The only real struggles against oppression I have respect for is when they are led by the oppressed. I’m afraid I have very little time for professional revolutionaries. This is a slightly weird discussion, Frank, as my original comment made no mention of communism. For me, the point of Andy Wightman’s tale is not that we should be encouraged to join the tenant in their fight to become the landlord but, rather, that we need a political movement that will aim to transcend “landlord” and “tenant” as socially meaningful categories. Now this does raise the question of communism so, for that reason, I accept your challenge to discuss the matter; but I do think it’s important to clarify my basis for doing so. I don’t vent anger at people who hold property, as such. The rich are as alienated and as conflicted as the poor, which is why I would consider a political movement which offered solutions to abolish the tenant/landlord power nexus in favour of some other arrangement as offering to liberate landlords as much as tenants. That’s also why I don’t agree with you about revolutionaries needing to live without any property of their own. In fact, I suspect your position is more elitist and vanguardist than my own – by setting such a difficult barrier to revolutionary participation, you deny access to a lot of ordinary people. My position is neither elitist nor vanguardist. I don’t believe in the politics of liberation because I am increasingly of the view, that oppression will just take on new forms. Plus who decides on who needs liberated? That said, people should always fight against oppression, if they are oppressed. I agree with you about alienation, but like oppression, alienation will take on new forms. Work to some extent is always going to be alienating, whether it’s the private firm, the state, or the workers collective. On the question of revolution, I can’t comprehend why anyone with property, a decent income, etc, would wish for a revolution, although they could be ‘theoretical revolutionaries’. For me, the purpose of progressive politics in the here and now is to prevent the material conditions from arising which would cause a revolution. I appreciate the frankness with which you express your view, Frank – you, at least, live up to your name. You would probably make an excellent revolutionary. The whole rentier system ought to be examined and changed! No mention here of the money creation system. Private banks issue new debts and in the process create new money. Excluding loans made to other banks for financial speculation, the majority of the new loans are made for mortgages for private property. As more and more money chases a finite property market, prices rise. As prices rise, speculators invest in properties as a way to make money, further pushing prices up. As prices go up, mortgages go up and landlords need higher rental incomes in order to keep the show on the road. A sensible strategy as a landlord is just to cover the mortgage payments and make a little bit of extra money to cover risks and downtime. The real gain is the capital appreciation of the property as the mortgage is paid off and the property transfers from the bank to you. So this reasonable and modest strategy is not the root of the problem. The core problem is that the creation of money is controlled by private banks who have the power to decide how it is invested. And they choose to invest it in the property market over productive assets such as business startups and growth, and over public value infrastructure and projects, such as healthcare, education and railway upgrades. Unreasonable rent increases is just one symptom of this underlying problem. About time some protection was given to tenants of private housing It is ridiculous how these landlords have been getting away with highway robbery (to put it mildly) for decades.Security of tenure is another vital step. Security of tenure will only drive private landlords out and to suggest it is actually counter-productive. What is needed is fair rents and longer tenures. In most countries in Europe where private renting is more commonplace the normal contract is for two to three years. Older readers may remember the Rachman scandals of 1950s London. Rachman was a landlord of low end property who resorted to violence and intimidation in order to get ‘sitting tenants’ to leave so that he could sell the land to developers. But that was the kind of thing that happened when landlords were prevented from getting vacant possession of their property on a legal, and regular basis. You can’t really sell a property that has a sitting tenant in it, unless of course you sell it with the tenant in it as well, to another landlord, as a sort of going concern. But the value of something on the open market that you can’t actually get into, is limited. Imagine trying to sell a car that you wouldn’t actually be able to drive because the keys were in the possession of somebody else, who didn’t actually own the car. As I have mentioned elsewhere the SNP are complicit in aiding the wealth creation of the elite , despite their socialist protestations. Aiding private developers and landlords to continue Maggies coralling of the poor , which keeps the rich to the manner they are accustomed , their removing the RTB , rather than improving it with reinvesting the money instead to build more = which would have been more of a slap in the face to the auld Tories than its repeal is simply tragic , and only aiding the rich to get richer , ie banks and private landlords by reducing the available supply , controlling creation and the cost to own new. On report in his local paper , is a North Ayrshire MSP happy that it will take 117 years to fill the council waiting list with NEW council housing. He was Happy to qoute stats in the need for social housing going down , USING shelter own data , while private renting has increased , and population is decreasing decreasing the numbers as somehow a SNP promise delivered. I refuse to use the term Social housing having came from Council housing myself , where the housing was paid for many times over in rent in the most cases in Scotland , so discounts were valid , especially when you consider the hundreds of thousands of council stock , flats and houses , bulldozed on order from Westminster – that lay empty in former manufacturing towns for a generation. SNP derived Local development plans are aiding the rich to get richer. 300 objections to using farm land for executive housing , all ignored , reporter to the Scottish parliament report basically was geared towards aiding developers from the off was hardly impartial in not finding the objectors valid. Hardly the land reform and protection of rural communities that the SNP bang on about as core and future policy. Local Development plan steered by SNP , ordered by SNP led Hollyrood legislation ,Council SNP LDP chair not informing the committee of qualifying criteria that would exempt land from development being Party and Hollyrood , never mind council themselves own policies. Ignoring Historical denials , when council was Labour led with less objections , reclassifying land as infill when it was outwith the boundary are all on record. Cant expect any investigation of dodgy dealings there , leader of the council on the land development panel is related to MSp? , new MP his wife , and of course the provost no other than the mother of the first minister. Somehow I dont think they will ask for a review of procedure , after all Hollyrood had the final say and rubber stamped it , somehow against their own policies and directives manuals. Snp are happy to Use charities like Shelter , whom may also be complicit in allowing their use of shelters data to be skewed , in order to look like progress in their supply of housing , including unaffordable housing costing 270k touted as affordable …. which is more than 7x the median wage , hardly the 3x median wage which makes mortgage repayment affordable to the majority never mind the low waged. 7x main income , This is subprime territory , Maggies mortgage slaves II , where like the rent listed above would be more than 40 percent of the take home income , but at least you are buying your own home with a view for longer term income increasing. But then again it may just be an Ayrshire thing , but I seriously doubt it , the figures stats and ignoring communities , ignoring their own mandates , well it is in every council area. When it comes to councils they can supply a new 2 bed bungalow for 50k , yes really that cheap , using their own land , with modern sip panel construction , while using LOCAL council trades and apprentices.When the need arises for more room simply extend to the loft , when empty bedroom taxes are felt by renter or council by new legislation against the poor simply board the extra room up. This while keeping RTB based on build replacement costs available to the renter , reducing the profit for banks , through a co-op stamp style savings book to buy your home direct , making councils lenders of first choice , using the renters savings to fund expansion and rate of supply of council stock outwith interest bearing loans that could bancrupt a fiscally inept council. But this will remove the profits for the banks , landlords , contractors and developers , rather than empowering the wealth of communities the housing will be in and creating local employment. But will they do it , no , its far better to use farmland and aid the landlord , land owner , and private developer to profit , far better for councils to sell off land for envelopes and councillor or mp , msp favour. Grade one farmland 5k an acre if used for famland , for developing its then worth 10 million to landowner and developer each in the case I know of. Council tax bands for exec housing is much higher than building in brownfield and social housing, this while the council had on its books from 23 – 35 acres of land with planning assured – available for sale for PRIVATE DEVELOPMENT. So where is the building of new council stock if they already had the land , its THE SNP dirty privatization by the back door secret , control the council , sell the land off , no intention of supplying council property , after all supply and demand and all that inflates resale and rents. But what do you expect of a party with links to pressurized mortgage mugging , allegedly , and of course links to mortgage fraud now showing , ie Thomson and her solicitor. SNP all to ready to complain about RTB , but not for a core MP to profit from it by proxy as a second party , and dodgy purchase contracts….allegedly. Rent controls , aye right , fae the SNP , nearly sharted laughing. C Rober it will eventually come back and bite them on their a–es,I will vote for them as the best pos only vehicle to independence,give me the common weal every time,no politics no political agendas just clear thought out proposals that can be put to the people. Me too John Y , a means to an end , the SLAB crew are still taking orders from England , lying about Hardie and Dewar , project fear , ruined a Socialist Labour voter over time opinion of them. But unfortunately there was still some that had a red soul that got their jotters for following party orders. The original topic is something of deep importance to me , rent and property. But the truths about SNP also need to come out , it affects rents , affordable housing that isnt , developers and landowners increased with their direct help to the tunes of tens of millions over supply of new council stock. The belief that the SNP deliver, when its more like cooking the books , if they do this with housing , then perhaps project fear was right? The media need to look into it , not merely one mp profiting from RTB by proxy , from the party that has got rid of RTB claiming it is creating the problem … when they have the levers to change it , locally and nationally , to improve it and of course increase supply why are they not? Austerity as the 1 percent have doubled their wealth in the same time , something stinks , its naw bravehearts in Hollyrood , its lawyers , accountants and millionaires , hardly the socialists they have made themselves out to be since the financial crisis . tartan tories rising again. For 20 years the SNP have complained about cronyism in labour councils , Check out North Ayrshire , Mp married to the Msp , ANOTHER family member leads the council , Mother of the Fm the provost , and theres a lot more in the mcmafia family business that is SNP politics down to special jobs for relatives like contracts to act as consultant to the NHS for NAC costing tens of thousands…. sounds like labour of old. Having worked all our lives my wife and I decided to buy a property to rent out as an investment. That was almost 5 years ago. It’s a “lower end” property and our view has always been that we provide a good home for our tenant. In the 5 years we have made little profit. Our rent and the ongoing costs have largely balanced themselves. Repairs are carried out within days of being reported and worn furnishings are replaced promptly. We have raised the rent once in the 5 years. We have lost some money through tenants not paying but, in general relationships with tenants have been good. We MAY make a small profit from the venture when we eventually sell. My point is this. If renting isn’t profitable, and flexible, for small scale landlords like us then legislation, designed to get poor landlords to do more, will drive people like us out. We will, no doubt, sell to more businesslike landlords. Perhaps the market standards will level out and that might be best. I’m not sure our tenants would agree. Having said all of that, we were brought up in council homes. We were, and still are, against the selling of such homes and we do believe people should have access to affordable good quality housing. Getting to that position will require radical re-thinking in the housing market. House prices will have to tumble and I can’t see the establishment allowing that. Thatcher ended regulation of the private rented sector with her Short Assured Tenancy Act in 1989. This introduced a tenancy period of only six months – it became legal to offer a tenancy contract for only six months. This abolished security of tenure and rent controls. It led to a boom in private renting in the 1990s, 2000s, and 2010s, as people who could buy property were encouraged to become landlords, secure in the fact that they could gain vacant possession of their property after only six months. Six months is far too short a period for anybody renting to feel secure in, however it’s important to note that tenants are in practice frequently offered a repeat contract of a further six months, then a further six months, and so on, often for three or four years at a time. It frequently suits landlords to have long tenures. But it’s very important for landlords to gain vacant possession from time to time in order to upgrade and maintain the property. It’s very difficult to re-decorate if a tenant’s possessions are in the room. Putting in a new bathroom or kitchen is also an unacceptable level of upheaval for a tenant to put up with. Plus, if a landlord cannot gain vacant possession on a regular basis, then the value of their property is virtually zero, as what is the market value of something you cannot actually gain possession of? A sitting tenant, if they cannot be legally and peacefully removed by a contract eventually coming to an end, causes a property to drop dramatically in value. Thus nobody in their right mind is going to want to be a landlord of a valuable property, such as in popular tenement areas like Marchmont or Bruntsfield where many students live. They will either sell up, which will probably be no bad thing, as this will bring in more owner-occupiers and end the curse of whole stairs full of rented properties on short term lets with no real permanent neighbours, or else they will rent it out to tourists and holiday makers, which would be infinitelty worse. ‘Party flats’ are a well known curse in Edinburgh, used for hen and stag night visitors. Alternately, another response might be to be extremely picky about the kind of tenant you let your property to, so as to effectively exclude anybody who looks likely to want to stay long term, such as by stipulating in the contract ‘no students’, ‘no DSS’, and requiring references from employers which show that the tenant is a high earner likely to leave as soon as they are able to find a deposit for their own house. Or they might simply keep the flat empty, as it will continue to rise in value anyway if it’s a popular area. The low end of the market is unlikely to be much affected, as ex-Council houses bought for next to nothing often have little market value. They were bought up by cash buyers when their owners, ex-Council tenants, tried to sell them, then found they couldn’t because nobody who could afford a mortgage much wanted to live there. The value of such properties lies to a much larger extent in their rent. So all in all, students and young people looking for places to stay in trendy places are going to find that these flats are no longer available for them to rent. That was what happened before 1989, when the only type of property students and young people in low paid jobs could rent were dumps that had little market value. Another long term effect of security of tenure was that property could not be maintained as landlords were prevented from gaining vacant possession on a regular basis, so it just declined. Rooms had peeling wallpaper dating from pre-WW1 as late as the 1970s. So all in all, what is needed is a middle way between the two extremes; affordable rents, yes, but not indefinite tenures. A tenure of two to three years is a better ideas as it provides some greater certainty for tenants but allows the owner the opportunity to renovate or sell his property, preserving its market value.